Huntington, Calif., manufacturer of water purification equipment and accessories, specializing in reverse osmosis seawater and brackish wa- ter units for marine applications, recently introduced a new product designed to make cleaning and pres- ervation of membranes used in Re- verse Osmosis water purification equipment much easier. The membrane care skid consists of a mixing tank, flow meters, valves, thermostatically controlled heater, a pump and a motor. This facilitates safe and easy mixing of cleaning chemicals, insures proper delivery of solutions to the membrane/pressure vessel assembly and safeguards against high temperatures and ex- cess flow rate which both can be potentially damaging to membranes. "We have seen the lifetime of sea- water membranes exceeding 5 years with proper care," said Ed Kimmel, president of Lifestream. "The use of our membrane care skid will assist in prolonging the life of this expen- sive component of an R.O. system." Rate circuits, PATHFINDER/ST receiv- ers faithfully capture target returns even in severe clutter. PATHFINDER/ST multistage processing analyzes, compares, tests, and samples the received signal so that all detected targets, no matter how weak in signal strength, are distinguished from clutter and clearly displayed. Raytheon's exclusive Superior Technology provides sharp, bright radar pictures virtually free of clutter. PPI's (16" or 12" diagonal CRT IMO equivalents), provide automatic tracking of up to 40 targets with vectors and readouts for most dangerous 20. Have auto and manual acquisition, and unique trial maneuvers. TCPA for two selected targets. Raytheon sets radar performance stan- dards for the 21st century with technolo- gy breakthroughs that virtually eliminate noise, interference and clutter, while rec- ognizing and displaying even weak tar- gets typically lost on other radars. PATHFINDER/ST, your vessels-and their crews-can have an important extra mea- sure of safety and efficiency, including a unique Safety-Coded CPA Circle, which shows course selections for safest CPAs. Systems, and can be high-performance repeaters for radars of most other manufacturers. 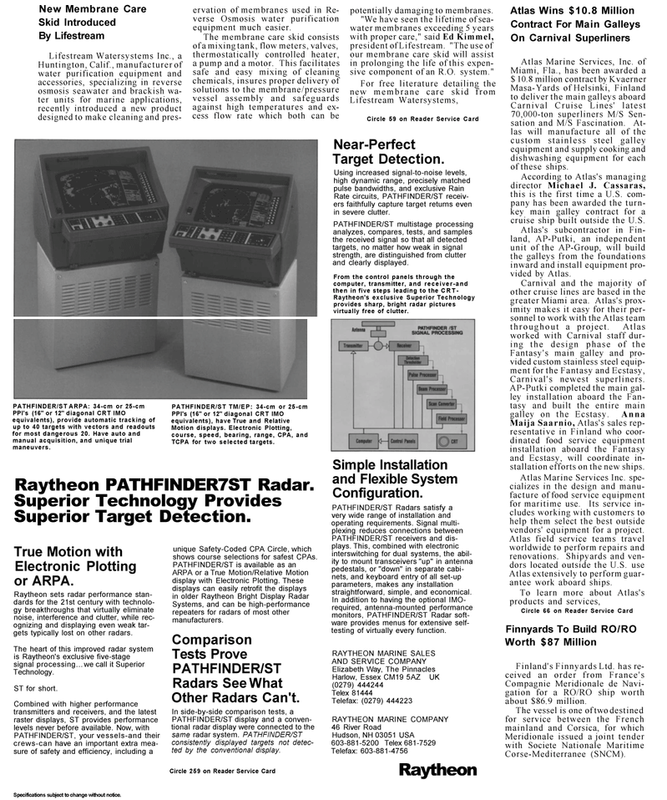 PATHFINDER/ST display and a conven- tional radar display were connected to the same radar system. PATHFINDER/ST consistently displayed targets not detec- ted by the conventional display. PATHFINDER/ST receivers and dis- plays. This, combined with electronic interswitching for dual systems, the abil- ity to mount transceivers "up" in antenna pedestals, or "down" in separate cabi- nets, and keyboard entry of all set-up parameters, makes any installation straightforward, simple, and economical. In addition to having the optional IMO- required, antenna-mounted performance monitors, PATHFINDER/ST Radar soft- ware provides menus for extensive self- testing of virtually every function. Carnival Cruise Lines' latest 70,000-ton superliners M/S Sen- sation and M/S Fascination. At- las will manufacture all of the custom stainless steel galley equipment and supply cooking and dishwashing equipment for each of these ships. According to Atlas's managing director Michael J. Cassaras, this is the first time a U.S. com- pany has been awarded the turn- key main galley contract for a cruise ship built outside the U.S.
Atlas's subcontractor in Fin- land, AP-Putki, an independent unit of the AP-Group, will build the galleys from the foundations inward and install equipment pro- vided by Atlas. Maija Saarnio, Atlas's sales rep- resentative in Finland who coor- dinated food service equipment installation aboard the Fantasy and Ecstasy, will coordinate in- stallation efforts on the new ships. Atlas Marine Services Inc. spe- cializes in the design and manu- facture of food service equipment for maritime use. Its service in- cludes working with customers to help them select the best outside vendors' equipment for a project. Atlas extensively to perform guar- antee work aboard ships. Compagnie Meridionale de Navi- gation for a RO/RO ship worth about $86.9 million.